Dina, only sister of Joseph, before his coat of many colours. Now it’s her turn to be heard. Concert performances of a full-length modern opera combining sung and spoken word, Song Of Dina gives voice to the feelings, questions and unique vision of this young woman whose story in the Bible is told only through the eyes of the men around her. 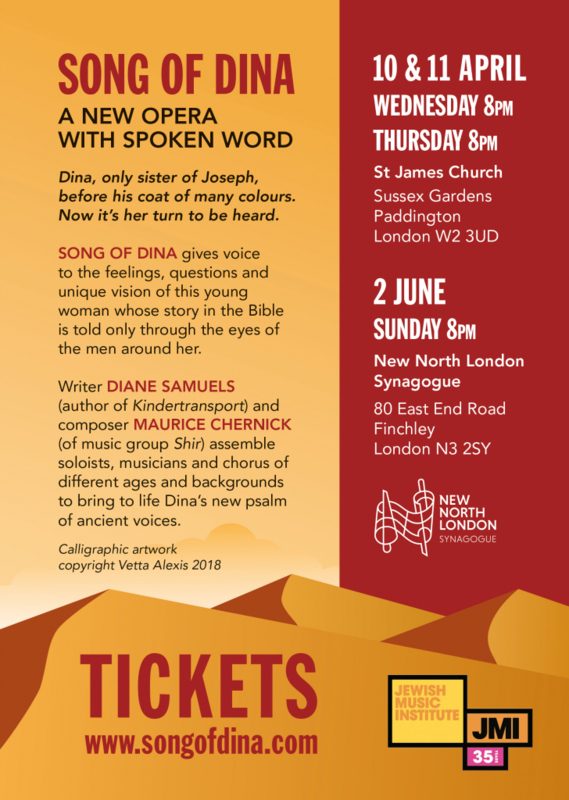 Writer Diane Samuels (author of Kindertransport) and composer Maurice Chernick (of music group Shir) assemble soloists, musicians and chorus of different ages and background to make a live recording as they bring to life Dina’s new psalm of ancient voices. Premiere Performances: Wednesday 10th April & Thursday 11th April 2019. Summer performance: New North London Synagogue, 2nd June 2019. DINA is the only daughter of Leah and patriarch Jacob. She has eleven brothers, including Joseph of “technicolour dreamcoat” fame (the twelfth, Benjamin, is yet to be born when her story unfolds). Often written in English as Dinah, this spelling changes the Hebrew pronunciation from a short “ee” to a long “eye” sound. So, to be true to the Hebrew pronunciation, we choose Dina. Her name means judgement; judged; vindicated. One commentary suggests that when Leah was first pregnant with Dina, she was carrying a boy. She felt that her sister Rachel, as yet childless and also married to Jacob, might be further distressed by her bearing another son. So she prayed for this child to be female and Dina was born a girl, with a male soul. So perhaps Dina’s lesson is to come to understand who she is from the inside not from the outside. And to discover the value of her true femininity (is this why she goes out seeking the daughters of the land beyond her own tribe?) as well as her masculine qualities. How might she deal with the vengeful “honour killing” perpetrated by her brothers that they claim is in her defence? And what might any of us today learn from this young woman in search of her self beyond her supposed identity as defined by family, tribe, beliefs and customs? She is first mentioned in the Bible in the book of Genesis, Chapter 30. In Chapter 32, strangely, she is not mentioned when Jacob sends his family across the River Jabbok the night before he prepares to meet his older twin brother Esau, whom he has not seen for many years since he tricked him out of his birthright and father Isaac’s blessing to be the next patriarch of the descendants of Abraham. In Chapter 34, her story is told.,Yet, only one action is seen from Dina’s perspective. Everything else that unfolds is told from the point of view of the men involved. After Dina goes out from her family encampment, Shechem, son of Hamor, king of the Hivite tribe long-settled in the region also known as Shechem (modern day Nablus on the West Bank), sees Dina and “violates” her. He then falls deeply in love. It is written that his soul “cleaves unto her”. With his father, he approaches Jacob and his sons and asks for Dina to become his wife. Outraged at his actions, Dina’s brothers demand that he show his goodwill by becoming circumcised, like the men in their tribe. Moreover, every other Hivite man must be circumcised too. Shechem persuades his people to do this. 3 days later, two of Dina’s brothers, Simeon and Levi, lead the others and, whilst the Hivite men are weak after the circumcision, they kill every single one of them, taking their women, livestock and land for themselves. BUT WHAT DOES DINA FEEL, THINK, EXPERIENCE AS THIS STORY UNFOLDS? WHAT IS HER PART IN THE ACTION? 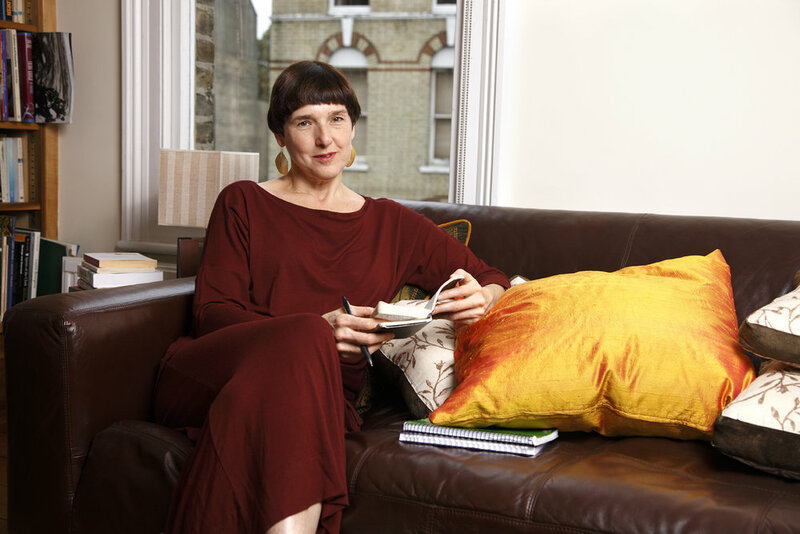 Born and raised in Liverpool, Diane currently lives in London where she has been working as an author and playwright for over 25 years. Work includes KINDERTRANSPORT, winner of the Verity Bargate and Meyer-Whitworth Awards, first produced by Soho Theatre Company in 1993, translated into many languages, performed in the West End, Off Broadway and all over the world. Other plays include THE TRUE-LIFE FICTION OF MATA HARI, Palace Theatre, Watford, 2002; HOW TO BEAT A GIANT, Unicorn Theatre, 2007; PERSEPHONE (a love story), with Maurice Chernick, Rosemary Branch, 2013; THE A-Z OF MRS P, with Gwyneth Herbert, Southwark Playhouse, 2014; POPPY + GEORGE, Palace Theatre, Watford, 2016; THIS IS ME, snapshots of girlhood, life-story as interactive monologue, Chickenshed, 2018. Her plays and book, “DIANE SAMUELS’ KINDERTRANSPORT” are published by Nick Hern Books. MAURICE CHERNICK is composer and orchestrator of Song of Dina. Born in Manchester, he spent his teens in Liverpool and now lives in North London where he works as a performing musician, composer and teacher. Throughout the 1980’s Maurice worked extensively in England as an actor/musician in theatre and TV, composing music and lyrics for, amongst others, Yorkshire Television, the York Theatre Royal, The Thorndike Theatre in Leatherhead, Leeds and Derby Playhouse, The Unicorn Theatre, and has written several musicals including A Midsummer Nights Dream and The Trojan Women. His most recent musical, Persephone, A Love Story with Diane Samuels, was showcased at The Rosemary Branch Theatre in Islington in 2013. Maurice also plays clarinet and sings all over the UK and Europe in the Klezmer Band Shir which he manages and which performs Jewish folk music from Eastern Europe, Spain and the Middle East. He started the band seventeen years ago and they are a major force on the UK Jewish Music scene. They won Best Performance of a Yiddish Song at the Amsterdam International Festival of Jewish Music 2012, and have been frequent performers in music festivals in Santander, Madrid and Cordova. Somehow he is also finding the time to be Deputy Director of Music at The Henrietta Barnett School in North West London where he is jointly responsible for the music programme offered to girls between 11-18 years old. 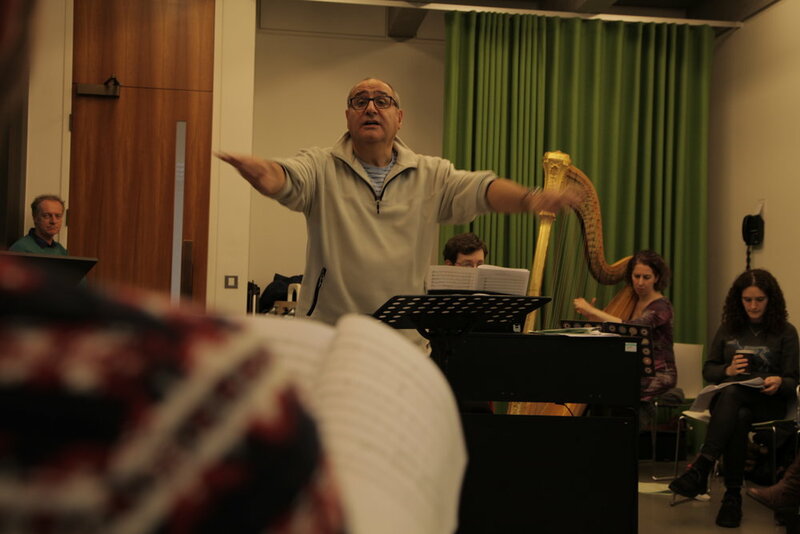 Since he began teaching, Maurice has written a huge range of choral and instrumental music for performance by his own students as well as those of other schools and in 2001, he composed the song sung by Enfield schoolchildren for the borough’s first ever Holocaust Memorial Ceremony.